I’m not talking about psychedelic mushrooms here, I’m talking about the mighty Lion’s Mane mushroom. Lion’s Mane Mushrooms (Hericium erinaceus) is a well-established medicinal mushroom that has been used in China (and beyond) for millennia. The Lion’s Mane mushroom is presumed beneficial to the brain, heart, and gut–all important in the stress equation. 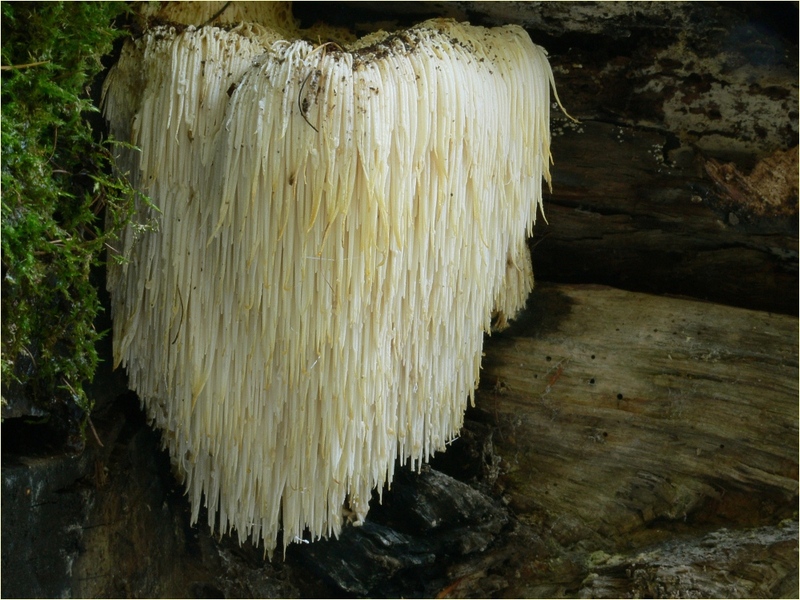 The common name, Lion’s Mane, resembles the mane of a lion. Named for the resemblance of the long shaggy hair of a lion, this distinctive mushroom, Hericuium erinaceus, translates the word erinaceus from the Latin to mean hedgehog, and the name seems to fit as well. It has been gaining increased attention in the West for its health benefits, including relief from stress, anxiety, and mild depression, and repair to the nervous system from their harmful effects. Although stress relief is our focus, its benefits as a superfood goes far beyond (more below). In Japan, it is named yamabushitake which translates to “those who sleep in mountains.” This name refers to the Shugendo sect of “hermit monks” and their long flowing robes. 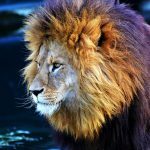 Recent studies have shown that the lion’s mane mushroom helps promote nerve growth, increases neurotransmission, and recognition memory, and may protect your brain from Alzheimer’s-related damage and has beneficial effects on brain health. One such study published in the Evid Based Complement Alternat Med concluded that daily administration of H. erinaceus promoted the regeneration of nerves from injured rats. Also noteworthy, the researchers also found the activity of Hericium erinaceus promising in the stimulation of Nerve Growth Factor or NGF due to the hericenone component of from the mushroom and erinacines from mycelium, the vegetative part of a fungus. Bioactive substances of the Hericium erinaceus mushrooms, including hericenones and erinacines, have been shown to stimulate the growth of brain cells. These bioactive components have been shown to be powerful in the maintenance and regeneration of nerve cells by inducing NGF, including the hippocampus area of the brain. 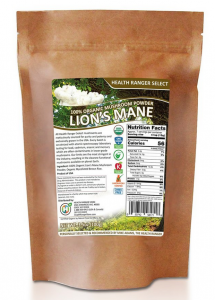 One active ingredient in Lion’s Mane mushrooms is Beta-glucan polysaccharides isolated from Lion’s mane boast whole-body effects that have been discussed in peer-reviewed research. 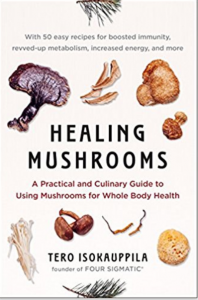 Curious How to Use Medicinal Mushrooms in Your Daily Routine? Great selection of recipes, which kinds of mushrooms to use to creative magic in your kitchen. As published in Mycol Progress research article “Hericium erinaceus, an amazing medicinal mushroom” and other linked journals. Stress is an underlying factor in many diseases and may contribute to cancer. 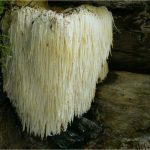 The Lion’s mane mushroom has increasing interest in recent years and also has great value as an anti-cancer agent. The Journal of Ethnopharmacology (medicinal plants) reports on the anti-cancer effectiveness of Hericium erinaceus on gastric related cancers. Like many diseases, stress (be it oxidative, environmental, or psychological) contributes to cancers. Researchers publishing in the Journal for Agricultural and Food Study showed findings the Hericium erinaceus inhibits metastasis of cancer cells. It is important to note that the studies mentioned here all called for further research to be done on humans. Lion’s mane mushrooms are consumed in their raw form, dried powder, cooked, or prepared as a tea. See product review section at end of this post. 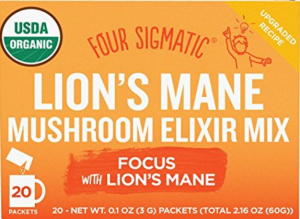 I am a proponent of adding Lion’s Mane mushrooms into your daily diet as a super food rather than ingesting them through pill form, however this is a personal preference. Used in Asia for centuries as a culinary, the Lion’s Mane mushroom is both food and medicine. Are the ingredients pure and organic? What levels of quality testing is performed on the product? Please consult your healthcare provider if you have food sensitivities prior to ingesting medicinal mushrooms. The above statements have not been evaluated by the FDA. 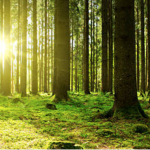 No need to forage mushrooms and risk incorrect identification! This product comes in a loose fine powder form and is easily added to a smoothies, soups, stews, lentils, or any great recipe such as Medicinal Mushroom Bites. If convenience is a huge factor, this product is typically not consumed directly. Must be added to a beverage or meal. Country of origin: grown and harvested only in the USA. Each batch is tested with atomic spectroscopy laboratory testing for lead, cadmium, arsenic and mercury. These heavy metal contaminants may be found in lower-grade mushrooms. Lion’s Mane Mushroom Elixer is a blend of Lion’s Mane mushrooms, rose hips, rhodiola, mint, and stevia. Love coffee? Try this unique blend of mushrooms and coffee and skip the recipes–all the work is done for you. Are Four Stigmatic ingredients pure and organic? Four Stigmatic has a qualtiy manual for consistent results. Review prepared by Anne Ruitberg Taylor, B.S., Ph.D. Thank you for reading about Lion’s Mane mushrooms. I love when we can use natural substances to improve our lives and reduce the harmful effects of stress, inflammation, and unnecessary additives. Although there are a wide range of health benefits, please be cautioned that people with allergies may have sensitivities to mushrooms. As always, check with your healthcare provider before ingesting new foods or substances that may cause an adverse reaction.